Brighouse Town were beaten 2-0 at home for the second time in three days last night. Their latest setback came against division-higher Farsley Celtic in the West Riding County FA Senior Cup and followed an Evo-Stik NPL defeat to Trafford on Saturday, . Celtic have a sprinkling of former Brighouse Town players and two of them had mixed fortunes. 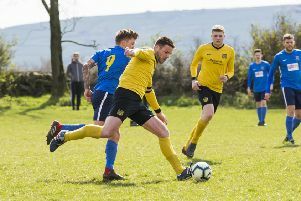 Midfielder Ben Atkinson got the crucial second goal on 72 minutes, shortly after another familiar face to Brighouse supporters, James Pollard, had been dismissed for a second bookable offence. It had been a stalemate for an hour, with Town giving an improved performance, before Adam Porritt made the breakthrough for the visitors. Town return to league action at Radcliffe Borough on Saturday.